MONTEREY, Calif.--(BUSINESS WIRE)--NextFlex, America’s Flexible Hybrid Electronics (FHE) Manufacturing Institute, acknowledged nine dedicated individuals who have made remarkable contributions to advancing the flexible hybrid electronics (FHE) ecosystem and industrializing the FHE manufacturing process at this year’s FLEX conference, during the third annual presentation of the NextFlex Fellow Award. NextFlex®, America’s Flexible Hybrid Electronics Manufacturing Institute, is a leading force in the Manufacturing USA network of Institutes. Formed through a cooperative agreement between the U.S. Department of Defense (DoD) and FlexTech Alliance, NextFlex is a consortium of companies, academic institutions, non-profits and state, local and federal governments with a shared goal of advancing U.S. manufacturing of FHE. Since its formation in 2015, NextFlex’s elite team of thought leaders, educators, problem solvers, and manufacturers has come together to collectively facilitate innovation, narrow the manufacturing workforce gap, and promote sustainable manufacturing ecosystems. For more information, visit www.nextflex.us and follow NextFlex on LinkedIn, Facebook and Twitter. 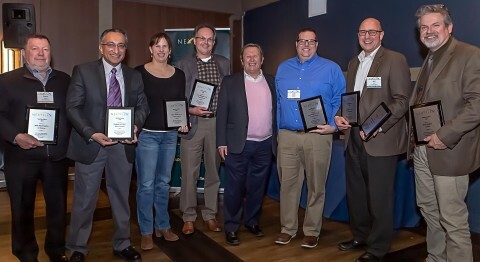 NextFlex recognizes the heroes of Flexible Hybrid Electronics with the 2019 Fellow Award.